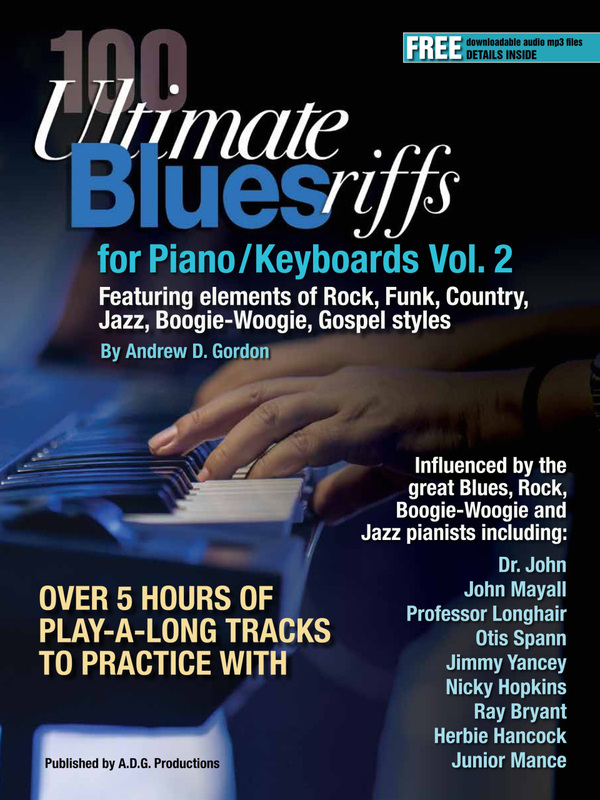 It has been over 20 years since I released the first volume of “100 Ultimate Blues Riffs for Piano/Keyboards” in 1996, my most popular selling book. One of the constants has been the continued popularity of my Blues music instructional books for not only piano/keyboards but also Saxophone, Flute and Guitar. With developments in music software, faster internet download speeds for downloading mp3 audio files, (over 5 hours of downloadable audio backing tracks for this book) I felt it was time to author a 2nd. volume that uses newer software for improved sound quality, . Also, it is the 50th. anniversary since I started to learn to play Blues piano in 1968. I remember the wonderful feeling I had when I started to learn from the first two Blues piano books I bought from a music shop along the Charing Cross Road in London, I still have both books “Just Blues” a compilation of Blues, Jazz and Boogie-Woogie songs and “How To Play Blues Piano” by Junior Mance. I have again created 100 Blues riffs with many of them having elements of Rock, Funk, Country, Jazz, Boogie-Woogie, Gospel and Latin styles. The riffs are in the order that I composed them, giving you the learner an element of surprise as to what the next riff is going to sound like. Each of the 100 riffs have been recorded twice, the 1st. time, the piano part with a rhythm backing track and the 2nd. time a rhythm backing track to practice playing along with. I have also created a separate play-a-long track that consists of 10 choruses of the 12 Bar Blues progression. I would hope that you will use each riff to build your own Blues “song” through the 12 Bar Blues progression.